Each individual heartbeat is a collection of several muscle movements spurred into action by electrical impulses. The first electrical signal comes from the heart's own natural pacemaker, the sinoatrial node, comprised of electrically active cells and located in the upper right heart chamber. This node sends a steady stream of electrical signals along a pathway through the heart's upper chambers. The signals then travel to the electrical bridge - the atrioventricular node - between the upper and lower chambers and, finally, move to the lower chambers. A problem at any point in the electrical pathway can disrupt the regular beating of a heart. Luckily, an artificial pacemaker - a small, battery-operated device - can take over the role of the heart's own electrical system, if necessary. 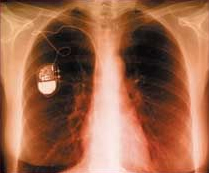 Although it weighs just about an ounce, a pacemaker contains a powerful battery, electronic circuits and computer memory that together generate electronic signals. The signals, or pacing pulses, are carried along thin, insulated wires, or leads, to the heart muscle. The signals cause the heart muscle to begin the contractions that cause a heartbeat. A pacemaker is implanted just below the collarbone in a procedure that takes about two hours. It is programmed to stimulate the heart at a pre-determined rate, and settings can be adjusted at any time. Routine evaluation, sometimes even via telephone, ensures the pacemaker is working properly and monitors battery life, which generally runs from five to ten years. The most common reason for a pacemaker is a heartbeat that slows to an unhealthy rate, or bradycardia. A pacemaker resets the heart rate to an appropriate pace, ensuring adequate blood and oxygen are delivered to the brain and other parts of the body. Can I have a MRI scan with a pacemaker? Prior to having a MRI scan contact your Cardiologist to see if your pacemaker is compatible. Single-Chamber Pacemakers - In a single-chamber pacemaker, only one wire (pacing lead) is placed into a chamber of the heart. Sometimes it is the upper chamber, or atrium. Other times it is the lower chamber, or ventricle. Dual-Chamber Pacemakers - In dual-chamber pacemakers, wires are placed in two chambers of the heart. One lead paces the atrium and one paces the ventricle. This approach more closely matches the natural pacing of the heart. This type of pacemaker can coordinate function between the atria and ventricles. Rate-Responsive Pacemakers - These have sensors that automatically adjust to changes in a person's physical activity. Other devices - Some devices, such as implantable cardioverter defibrillators (ICDs), designed primarily for other purposes, can function as pacemakers in certain situations. Bradycardia - a condition in which the heart beats too slowly, causing symptoms such as fatigue, dizziness or fainting spells. Bradycardia may be caused by the wear and tear of age or by conditions such as sick sinus syndrome (SSS) or heart block. Atrial fibrillation - a common heart rhythm disorder in which the upper chambers of the heart beat rapidly and chaotically. Sometimes people with atrial fibrillation can also have slow rhythms. Medicines used to control atrial fibrillation may result in slow rhythms which are treated by pacemakers. Heart failure - a condition in which the heartbeat is not sufficient to supply a normal volume of blood and oxygen to the brain and other parts of the body. A special pacemaker can be carefully programmed to increase the force of muscle contractions in the heart. This is called "biventricular pacing" or "resynchronisation" therapy. Syncope - a condition best known as the common faint, is usually not serious. Some patients faint when their heart rhythm becomes very slow. For a small percentage of people who experience severe and frequent fainting spells, a pacemaker may prevent the heart rate from slowing to the point of fainting.